Well I'm currently heading out of Tokyo as I type on the super-fast Shinkansen bullet train, heading towards the southern city of Nagasaki, the lesser known of the nuclear bomb hypocenters. 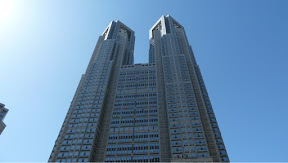 The past two days in Tokyo have been exhausting but equally exciting. But let's start off with the flight. I flew from Heathrow on an airline called All Nippon Airways, Nippon incidentally is what the Japanese call Japan, and it's countries outside of Japan that refer to it as the name we know it (the term Japan came to England from Portuguese sailors as 'Giapan' - have to get at least one fact in every update!). It was a great flight and as it flew over the very northern parts of Russia at night you were blessed with the view of the northern lights - at first I thought I was just sleep deprived but it was real and was purely magical. Arriving at the airport they take your fingerprints, picture and give you a tourist visa for 90 days. Everything is so swift and neat. But the best thing about arriving is collecting your bags. Now, not may things annoy me at all to be honest, I'd like to think on the whole I'm fairly calm and chilled out. But what always annoys me especially when landing in the UK is people who stand right up to the baggage carousel beyond the yellow line, with their trolley so you haven't got a prayer of getting or seeing your bag. 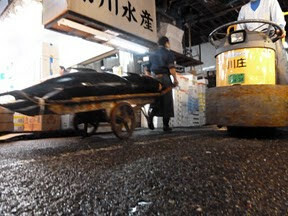 In Tokyo there is a level of respect that is given to others - everyone stands behind the line...it's perfect. Locating the hostel where I was staying was pretty straightforward, it's about a five minute walk from Minowa tube station and speaking of the tube and on the whole the transport system, everything is on time, it's clean and once you can crack the code on how the pricing works (it's a bit like London, but the zones are calculated from the station, so for example up to three stations from Minowa it's ¥160, between 4-8 it's ¥190. So quite simple). And despite the complex looking Japanese language there is always an English alternative and also a station code system. So Minowa station is on the Hiyati line and n maps it's H19. The hostel itself was really good, I shared a room with a group of three from Germany (two guys and a girl), they were extremely friendly and when arrived asked if I wanted to go out for a drink and a meal with them, sadly I had been up 26 hours so had to pass (my way of trying to beat jet lag didn't work). 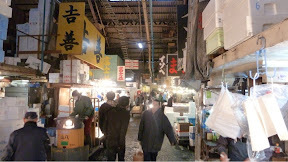 They did however say that they were going to the fish Market in the morning, this is lonely planets number one recommendation if you visit Tokyo is to see this market. The problem with wanting to see the market truly in action is to go when all the fish arrive and this meant getting up at 4am - but hey i was still on UK time so getting up shouldn't be a problem. ....but before i continue...like me, you will have seen pictures of Japan that show Mt Fuji in the background and in the foreground a White bullet train shooting across a bridge. Well that's me....right now. Awesome! There weren't many tourists there, about 20 or so, compared to the hundreds upon hundreds of regulars, so it felt quite raw, quite real, rather than something that's put on for tourists (if you know what i mean). 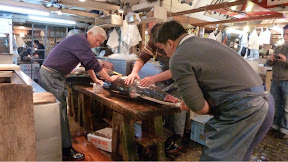 So as you navigate the different 'stalls' more fish is coming and being slapped onto a workbench and carved and cut by people are more artists than butchers, it's truly a remarkable thing to watch. 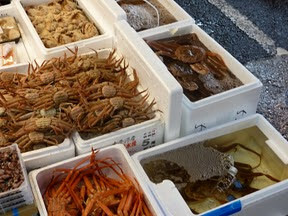 And boy are the fish huge, and not just fish; there were eels, scallops, crabs, and some huge crabs too! And a load of sea creatures I don't even know the name of. 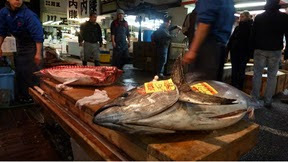 So myself and my new friends from Germany decided to head off to one of the sushi bars in the market, where all the workers tend to go, to try out some of the fish that was caught that morning. Now many of you know, I'm not really a fish fan. 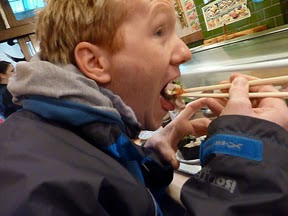 On trips to Yo Sushi i tend to play it safe with the chicken and veg options, but when in Rome...I tried it. And it was good. I'll put a pic on here, hopefully it will work, which shows you what i ordered. 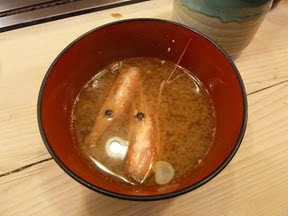 On the menu that i had, in most for the first time in my life was, shrimp soup, scallop, ark shell, squid, cockle, tuna, sea urchin, fish eggs and the most disgusting named but most delicious, fish intestines. 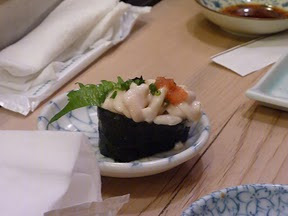 They were really nice and had a creamy flavour to them and a tofu texture. The funny thing for me is that I was always told by Jon at work that i will like fish eventually, and i flatly denied that would ever happen - despite force feeding me fish in Bristol. Well Jon, you were right, fish tastes good, especially the freaky stuff. In fact on the train at the moment I've just finished off baby octopus tentacles for a snack...a snack! 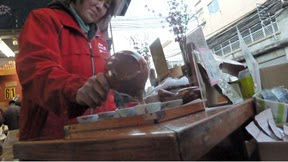 It was now 7am at the market, so we then headed off to walk round some of the small outlets on the rim of the market, and tried some lovely tea too - more lovely as it was freezing that morning so welcomed the warm cuppa. (it's between 5-10c here, quite nippy). 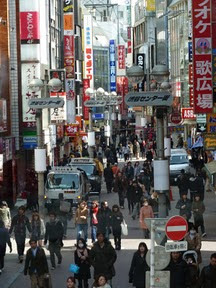 We then split up and i headed out through Tokyo trying to visit as many places as I could. 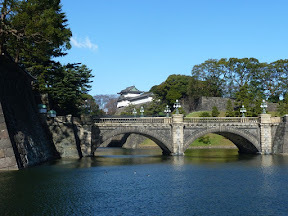 Started off by visiting the imperial palace gardens and then headed to a place called Shinkanju, to visit the government offices. 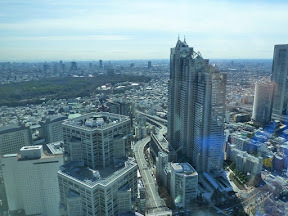 The offices allow visitors to go up to the 45th floor and look out on the view of Tokyo, and it was a stunning view. From an incredibly geek point, I loved the building and it's architecture, at 20 years old the building looked like it had just been built. And the coolest part is that between the train station and the office - about half a mile - there is a large underground walkway with flat escalators or travellators so that staff can get to work speedily. The Japanese really do think of everything in order to make life simple and easy. 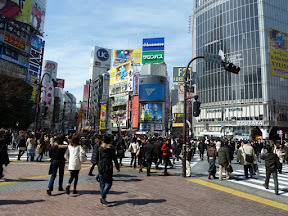 After the offices I headed to Shiboya which is most famous for the iconic traffic crossings. (please forgive the spellings of these places). You may have seen the pictures of hundreds upon hundreds of people crossing the road at the same time - a bit similar to the new one at Oxford circus in London. 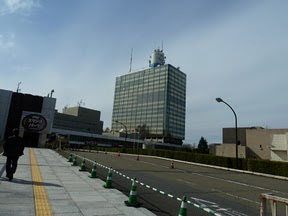 I then headed off to the Apple store, which was near funky Disney store, to see if I still want a MacBook air, which thankfully I still do, and then went to the NHK TV studios. NHK is the Japanese equivalent to the BBC, paid for by the Japanese licence fee, it's their biggest TV company and with the BBC its one of the leaders of innovative television. By this I mean as an example, they have developed the first 110inch 3D TV which you can view without glasses - and man is it weird to watch. Sat in this auditorium with 20 other people, all Japanese, you are at first requested to close your right eye and look at the TV logo on the screen and shift your head slightly to the left or right until the logo disappears. That's the sweet spot for 3D. They then played a video of a trip to the zoo, in 3D and it really was impressive. And like the Avatar 3D, the video was more about showing depth of field rather than a Jackass style of 3D coming at you. The rest of the tour was similar to the one I had at the BBC, where you could view the various studios from a gallery, watching shows being filmed and also views of live radio shows being produced. You also got the chance, like the beeb, to sit at a replica news desk and read the news in front of other visitors. And when I was asked if i would like to do it i of course jumped at the chance. However I had to point out to the guide that i can't speak a word of Japanese (she sadly couldn't speak english, apart from the word okay). Fortunately there was an English version of the script. I was partnered up to another volunteer from the audience called Sylvia, a school girl from china, who knew a lot more Japanese than i did and was asked to read her script (which was the same as mine). The group she was in spoke amazing English and helped translate from Japanese to me so I knew what was going on. It was hilarious. She started off solo and her japanese was very good, and then it was my turn. Having quickly read through the script I thought 'bugger it, I'm gonna go for it'. So I slipped into a news readers queens english accent, and read my piece from the auto cue. It was really good fun - and i have to say i didn't expect the standing ovation, nor the "You're Hired!" from audience, unless you're hired means 'you're crap, what the he'll are you doing here' in Chinese! So it was a great laugh and was good chatting to the teachers and kids about my trip and about the UK too. By the time I headed towards the train after my stint reading the news, the 4am wake up started to kick in. Falling asleep on the train a couple of times was unavoidable and fortunately I didn't miss my stop or changes. I had originally planned to go out with my german room mates that night but had to decline again - the jet lag, that I tried so hard to avoid, kicked in with a vengeance. I went to bed at around 5pm and woke up 6am. I decided for some bizarre reason to go for a jog, so had a run around the area and nipped into the shops for breakfast - a lovely rice and veg snack and, one of the things I love about Japan too, two hot cans of coffee that are in a heated 'fridge'. And so I spent the morning chilling out in the lounge at the hostel, exchanging iPad and iPhone apps and tips with some other residents, then i decided that i fancy going to Nagasaki earlier than i originally planned for three days - with at least one of those days just chilling. And that's probably the thing I'm finding challenging at the most, is to get out the 'city break - I need to cram everything in' mentality to literally switching off and enjoying the ride. So that's what I'm now trying to do. That's it for now. I'm going to enjoy this train journey, in first class (trying to ease myself into this backpacking!) 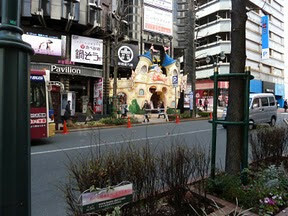 and figure out where to stay in Nagasaki. Apologies, I've noticed that the picture formatting hs gone a bit odd compared to my iPad draft, the pics should have aligned neatly above each paragraph it represents - hopefully it still makes sense. Great write up Dave. Sounds awesome. Two year holiday.......***###!!€$¥#*!!! 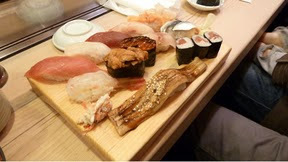 hi son we enjoyed reading about you trip andy say's he really enjoyed hearing about you eating the fish testi's in fact guess what we are having for tea tonight, yep you got it Baked Potato !looking forward to hearing about your trip to Nagasaki.Take care.x mum,dad daniel. Heya David it's Auntie Lynn, hope you're cleaning your teeth and changing your knickers everyday! Are you the only red head on the bullet? Or in Japan in general?! Hope you're enjoying your stay in the capsule hotel, nice and cosey i would have thought! Fantastic write up fella. Keep em coming dude. didn't realise you could cram so many things in just 48 hours! enjoy your experience son. Hey Possum! Loving the blog so far. Have you tried a bento yet? Apparently they're pretty good. Also try a bottle of Sweat! @Auntie Lynne - yes I was, not that many western tourists to be honest, mainly from Korea and China. Nagasaki simply has about ten Euro/US tourists - except when the cruise ships come in (QM2 due this Saturday but I'll be in HK). In terms of gingers, I'm the only one Ive seen. @Laura - hello! Not tried bento yet, but have seen sweat and will give them a go when I head to Kyoto or Hirisohima next. Hi dave looks great about time you took your uncle on an all expenses paid trip there,take care uncle john.